In 2002, a friend took this photograph. I felt very confident at the time, like a forgotten orchid suddenly receiving the right amount of sunshine, water, nutrients, and inner strength to bloom into an amazing being. Still though, at that point, I found it hard to take off my shirt, because I was worried far too much about how others might react to the sizeable scars across my chest. 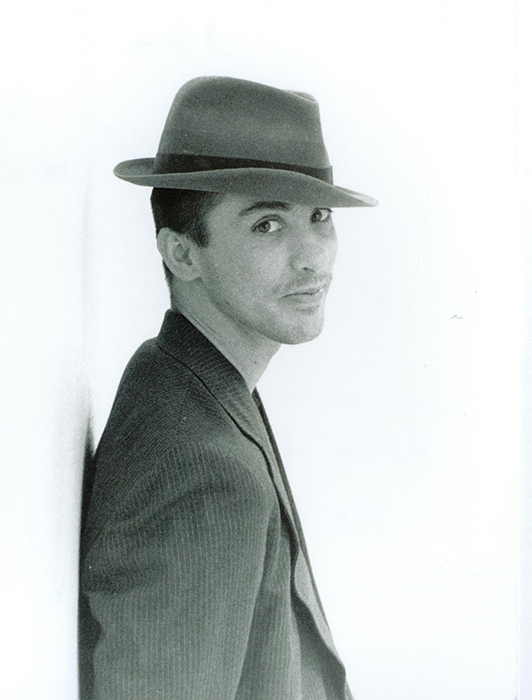 It had been a few years since my gender reassignment surgeries but, like a fugitive on the run, I expected trouble from all directions at any time. Everything was still too raw emotionally. No matter how unhappy and incomplete I had felt growing up in the “wrong” body, my mind now wasn’t just at rest after the reassignment. I needed some time to get accustomed to my “new” body, in all its beauty and imperfection. I was far too tuned to my surroundings and got upset about the smallest comments. I even gave up a friendship once because my buddy chose the somewhat unfortunate phrase “you’re neither fish nor fowl” to describe me. Years later, I smiled at my lack of confidence and my consequently harsh response. In a state of emergency it had been hard to see the bigger picture and relax about simply being myself. My friend had never meant me any harm. Like me he had merely dealt with adjusting to sizeable changes. Over the years, I pushed myself into extreme situations to learn and grow. The remedy to overcoming feeling awkward about people seeing my scars, for instance, came in the form of me working four years abroad as a snorkel guide and diving instructor, in a strict Muslim country, in nothing but my swim shorts. Today, I don’t even think about my scars anymore, and, as it turns out, neither do those around me. The overall issue of confidence is a lifelong struggle. Words or looks can still throw me off balance. I know now, however, that I am not alone in this. Depending on our daily form and a combination of factors we all have days during which we feel less stable, and others during which even a tornado wouldn’t be able to throw us off base. I guess the main thing is to forgive ourselves our imperfections, be they protruding ears, pimples, a lack of six-pack, being born in the wrong body, or any number of underlying reasons. After all, it is our imperfections just as much as our strengths that make us unique and beautiful. How humble and kind we deal with both shapes us and defines our character. It is a long-term learning process I am immensely grateful for. This entry was posted in Book, Inspiration, Memoirs, Paralian, Writing and tagged #book, #inspiration, #memoirs, #paralian, #writing on July 25, 2015 by liamklenk. 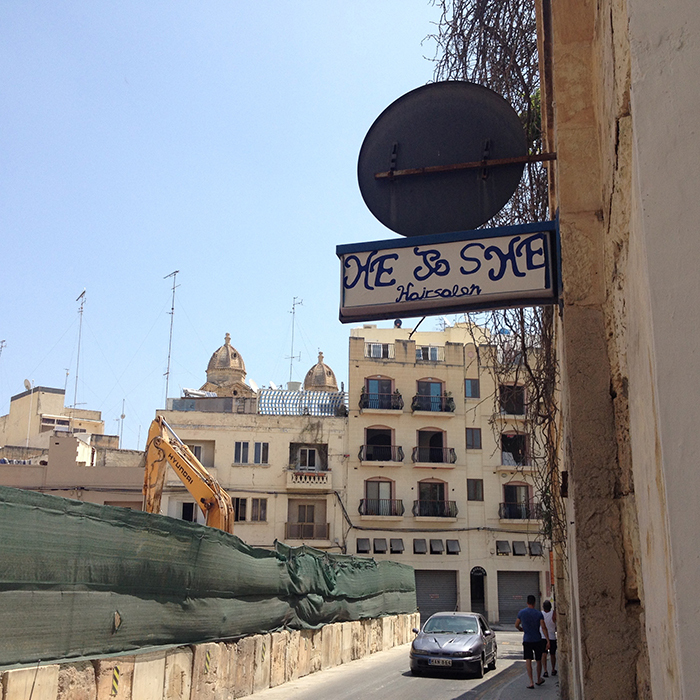 When we first arrived in Gzira, Malta, I couldn’t help but notice this cute sign. I would pass it every day, chuckling to myself as I imagined this tiny space to be a secret clinic for gender transitions. Of course, Gzira’s “He to She” is only a small neighborhood barber shop. Being a transgender male who doesn’t take himself too seriously, I became a regular. As imagination and humor swept me away, I would just barely manage to contain my laughter each time I went for a high-speed Maltese haircut. This entry was posted in Book, Inspiration, Memoirs, Paralian, Writing and tagged #book, #inspiration, #memoirs, #paralian, #writing on July 15, 2015 by liamklenk.